Most people who care for young children are hooked on Dora. Not only does she introduce little ones to Spanish words, she also presents several important early learning concepts. I love the way reading Dora books with children is interactive. Since children are asked to participate in the story, it is easy for them to remember the facts and lessons which are hidden among the pages. 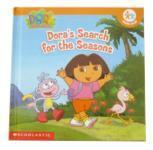 For this theme, Dora's Search for the Seasons will take your group on a trip across each of the seasons to help a baby flamingo find his family. As they visit Fall Forest, Winter Mountain, Spring Meadow, and Summer Lake, they will love pretending to pick apples and helping Dora, Boots and the baby flamingo select proper clothing, among other things. Why not make a map with your group? Help children add seasonal details to a forest, mountain, meadow, and lake of their own. Connect each section of the map with a path. When you are done, deposit the map on the floor and let children play on it with small cars or figurines. Having fun is the best way to learn!